The "Amazon effect," Huang said, will turn transportation on its head. Autonomous technology will play a big role for more point-to-point movement of products and people. Amazon has announced Prime Air, a future-looking program in which unmanned aerial vehicles will deliver products in under 30 minutes. Nvidia is backing the idea of autonomous cabs, and providing hardware and mapping technology for accurate point-to-point navigation. Self-driving cars from famous car brands are driving early excitement around autonomous vehicles, Huang said on an earnings call Tuesday. But the real appeal of autonomous technology is in areas like logistics and warehousing, which could also bring operational efficiency. In 2015, Daimler put a self-driving 18-wheeler truck on the streets, which was tested in Germany and at the time approved for use in Nevada. Last year, the autonomous truck delivered 51,744 beer cans from Denver to a facility in Colorado Springs.Â Self-driving tractors are also making farming efficient. The early batch of assisted self-driving cars need drivers at the wheel, and fully autonomous cars have been demonstrated by many companies. Google, Nvidia and Intel have put autonomous vehicles on streets, and tech companies like Apple are also chasing self-driving cars. 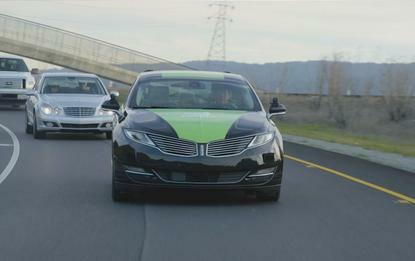 Nvidia and Intel have announced computers for cars. Nvidia's GPUs drive AI systems and data collection by sensors in cars. Intel is in the process of acquiring Israeli company Mobileye to get a full technology stack for self-driving cars. 5G communications networks -- which could be live by 2020 -- will play a big role in allowing cars to communicate on bad road conditions ahead, or for ambulances to find the fastest route to patients or hospitals. Nvidia reported strong earnings for the first quarter of fiscal 2018, mostly driven by the datacenter GPU business. Revenue was US$1.9 billion, up 48 percent from the same quarter a year ago. Profit totaled $507 million, growing 144 percent. During the quarter, Nvidia announced a deal with Paccar to develop autonomous trucks. Nvidia is holding the GPU Technology Conference in San Jose California, and Huang will share more details about its autonomous cars efforts during a keynote on Wednesday.